james franco | Wanna Catch a Movie? UK release date June 28. Directed by Evan Goldberg, Seth Rogen. This entry was posted in Trailers and tagged 2013, film trailer, james franco, Jay Baruchel, seth rogen, this is the end on February 27, 2013 by Jen Horsman. UK release date March 8. Circus magician Oscar Diggs thinks he’s hit the jackpot as he’s transported to the Land of Oz, but his encounters with three witches and the problems facing Oz’s inhabitants encourage him to become the great wizard they’ve been expecting. This entry was posted in Trailers and tagged 2013, film trailer, james franco, michelle williams, mila kunis, oz the great and powerful, Rachel Weisz, the wizard of oz, Zach Braff on February 4, 2013 by Jen Horsman. Sean Penn stars in the biographical film about Harvey Milk, a gay rights activist who went on to become the first openly gay man elected into the public office of California. Milk is a truly moving film that captures the rise and fall of Harvey, who was unfortunately assassinated by Dan White (Josh Brolin), less than a year after he got into office. The performances in this film are amazing. Especially from Penn who I have never seen connect with a script so well, his performance is most certainly the best and it’s great to see him pull off a role so well. Maybe it’s because of the undeniable history and influential role that Harvey Milk played in society. He is such an icon to the gay community and anyone that stands for equality, that I think everybody working on this project knew they had to do it justice. Brolin is fabulous as White and James Franco is brilliant as Harvey’s lover Scott Smith, really showing off his acting talents that are going to see him in this business for years. The focus within the film was great. Yes, obviously there had to be a certain level of attention on Harvey as he is the film, but it never strays from the point at hand making it coherent and consistent, two great features that some films lose focus of when trying to be perfect in every way. It also doesn’t shy away when documenting Harvey’s life. Though he was fighting for a very just cause, Harvey wasn’t a saint and the film doesn’t paint him out to be – which only adds to his levels of humanity. Some directors may have tried to manipulate Harvey’s lifestyle in order to paint him as the perfect role model, yet it’s these little traits that really place the film in the category of a great biopic and not some distortion of the truth, which was a very redeeming factor. Gus Van Sant directs the film and does so with a brilliant handle on the inspiring story. This film re-introduced him back to mainstream cinema as he had been directing art-house projects in previous years. It is smart, emotional, slick and very informative, and anyone who wants a closer look at Milk’s aspirations and vision should really turn to this film. Though these events happened just over 30 years ago it seems a lifetime away. The film gives great insight to a significant piece of history and shows how far we have come as a society since the late 70s, but don’t be fooled, we still have a long way to go. 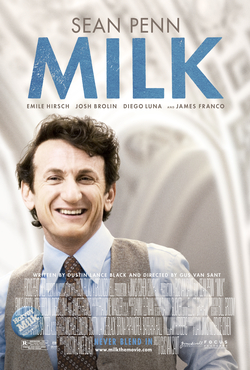 I can’t recommend Milk enough, a fantastic film that shows the rise and fall of one of the most influential people in history and his fight for equality, Harvey Milk. Directed by Gus Van Sant. This entry was posted in Film Reviews - M and tagged 2008, 8/10, california, emile hirsch, film review, gay rights, harvey milk, james franco, josh brolin, san francisco, sean penn on July 25, 2011 by Jen Horsman. As far as superhero movies go, The Green Hornet falls flat in failing to amount to the potential it had. It’s a far cry from the revitalised comic book genre that has seen both Batman and Iron Man make their marks and at best, it’s just an action-comedy under the façade of a superhero movie. When Britt Reid’s father dies, Britt is left in charge of his business, The Daily Sentinel, a front-runner of LA’s newspapers. He meets one of his father’s employees Kato, who he soon finds out is a highly technical mechanic. In a nutshell they decide to tackle LA’s crime by posing as a gang with advanced gadgets, hopefully uncovering other criminal gangs in LA and destroying them. 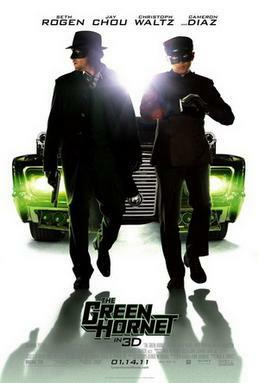 Under the guise of The Green Hornet and his sidekick, both Britt (Seth Rogen) and Kato (Jay Chou) aim to become more known to the public as to build a reputation. With the aid of The Daily Sentinel, it seems as though it was all meant to be. Enter the real villains. Chudnovski (Christoph Waltz) is the head of LAs biggest gang of criminals, often insulted and mocked due to his meek appearance and old age, he often needs an ego. When he hears of The Green Hornet he begins to do everything in his power to put a stop to this ‘rival gang’ before he loses the respect of his followers. Seth Rogen doesn’t portray Britt in the way I’d hoped, he seems to play the same character that we see in every one of his movies. His attitude throughout is pretty chilled out, with an apparent lack of connection to the script. It was a bit disappointing to see this yet again, and unfortunately he’s starting to morph into a one trick pony. While in The Green Hornet he is a rather brash character with money and girls at his disposal, I’ve seen the same character in Knocked Up and Pineapple Express. Christoph Waltz was a bit of a let down too. Compared to his role in Inglorious Basterds where he played the unforgiving “Jew Hunter”, his levels of malice and evil don’t shine through so well. This is most likely due to a completely different target audience though. The Green Hornet seems like it’s aimed toward a younger generation so obviously we can’t see the same type of evil from him, but a little more would have been great. I enjoyed Jay Chou as Kato though there is a slight problem in understanding what he is saying all the time. His accent can be a bit difficult to overcome but as the movie progresses, it does become less of an issue. He is fantastic in his role as the quick moving, martial arts expert though. Cameron Diaz plays a small part too, yet there is not much to comment on. She’s her usual pretty faced, indifferent self that had no real impact on me. I can barely remember any scenes with her. The highlight for me has to be the cameo from James Franco – though he only appears once and within the first 5 minutes. I just think he’s a great actor with an extensive career ahead of him, maybe they should have used him more. I do have to say that the cinematography was great. I didn’t see it in 3D but I can see where Michael Gondry was going with the film. From the slow-motion fighting scenes to the full on car chases, it was fun to watch. It seems a bit out of his area though, having previously worked on Eternal Sunshine of the Spotless Mind and Be Kind Rewind, so credit has to be given for that. All in all, if you’re looking for a really good superhero film that does the genre justice, I would turn to Batman Begins, The Dark Knight or Iron Man. For a bit of light hearted fun about a couple of wannabe heroes though, you’ll like The Green Hornet. This entry was posted in Film Reviews - G and tagged 2011, 6/10, action, cameron diaz, christoph waltz, film review, james franco, jay chou, seth rogen, superhero, the green hornet on June 3, 2011 by Jen Horsman. I wasn’t sure what to expect when I was on my way to watch this film. I knew the premise but couldn’t get my head around how they could make it into a movie – but they did, and it was great! After reports of audience members fainting, and warnings of scenes causing nausea, I knew it was going to be gory, but that didn’t deter me in watching this true and remarkable story of Aron Ralston’s triumph after spending 6 days trapped in a canyon. Directed and co-written by Danny Boyle, this biographical film documents real-life mountain climber Aron Ralston and his 127 hour struggle after his arm becomes trapped by a boulder in Bluejohn canyon, in Canyonlands Nation Park, Utah. James Franco does a fantastic portrayal of Ralston on his extraordinary journey. Over the time he spends trapped, he fondly recounts his past; focusing upon his family, friends, lovers and even the two hikers he met before his fall. After spending 6 days imprisoned with no water or food left, Ralston tries once more to escape, finding no other way than to cut his arm off. The movie is a powerful, raw depiction of events, drawing upon very personal experiences by bringing them to the forefront and allowing you to position yourself in his shoes. It points out the most important things in life, and through a camcorder- which Ralston actually had- we get a closer look into what thoughts were running through his mind. To have praise from the man who inspired the film is a huge compliment to Boyle, whose masterpiece also garnered six Academy Award nominations including Best Picture, Best Adapted Screenplay, Best Actor, Best Original Score, Best Original Song, and Best Film Editing at the Oscars 2011. 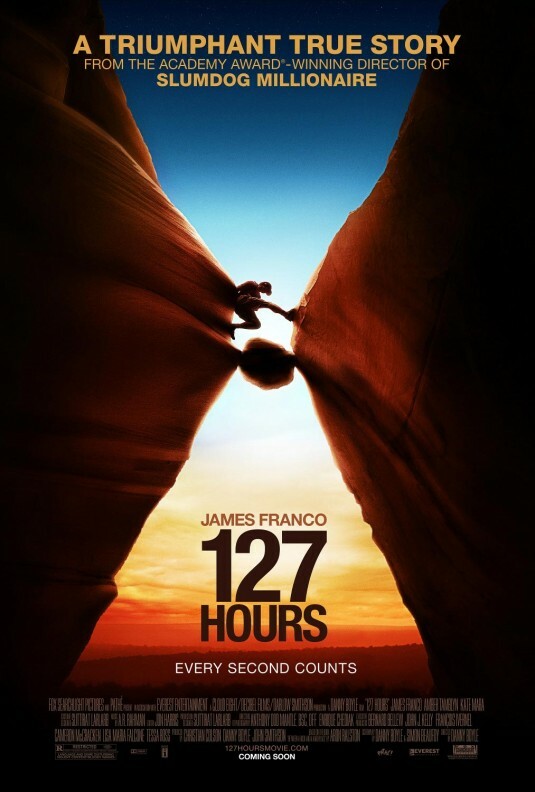 This entry was posted in Film Reviews - # and tagged 127 hours, 2010, 8/10, Amber Tamblyn, Aron Ralston, bluejohn canyon, cut off arm, danny boyle, film review, james franco, Kate Mara, oscars on January 26, 2011 by Jen Horsman.